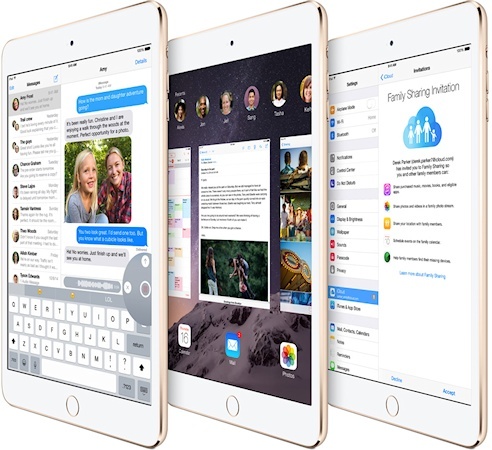 The Apple iPad Air 2 and iPad Mini 3 are the latest iterations of Apple's popular tablet line-up, coming almost exactly one year after the previous versions. Neither device is particularly groundbreaking, but Apple have made them both better in different ways. The Apple iPad Air 2 is almost impossibly thin, coming in at just 6.1mm thick, 1.4mm thinner than the original iPad Air, and it is over 30 grams lighter too coming in at 437 grams for the WiFi version or 444 grams for the WiFi + LTE variant. The screen size and resolution and the footprint of the iPad Air 2 is identical to the original Air, with a 9.7" 2048 x 1536 panel, although now it is fully laminated and has an anti-reflective coating. The camera on the back has been upgraded from 5 megapixels to 8 megapixels and it now has a burst mode. The Air 2 retains the 1.2 megapixel camera on the front. Underneath the new A8X CPU and M8 motion coprocessor are said by Apple to be 40% faster than the original iPad Air. The iPad Air 2 also supports Apple's new Touch ID fingerprint-sensing payment system. But if you want a really stark comparison you should go back two years to the Apple iPad 4, and in comparison to that the iPad Air 2 is only two-thirds of the weight and thickness but is a lot faster. If your iPad is two year old or more, then it is probably about time to consider upgrading. Available colours will be Silver, Gold and Space Gray with 16GB, 64GB or 128GB of storage (the iPad Air maxed out at only 32GB). As previously mentioned there is a WiFi only version or one with cellular connectivity too, and US prices will range between $499 to $829. Pre-orders start on October 17th with shipments starting next week in most major markets worldwide. There's not a world of difference between the Apple iPad Mini 3 and last year's iPad Mini 2, except the Mini 3 now supports Touch ID and comes with much more internal storage with 16GB, 64GB and 128GB versions as the Air 2 does. There's still a 7.9" 2048 x 1536 pixel display, 5 megapixel primary camera plus a 1.2 megapixel front-facing one. Available colours will also be Silver, Space Gray and Gold with WiFi and WiFi + cellular versions, US prices range from $399 to $729. 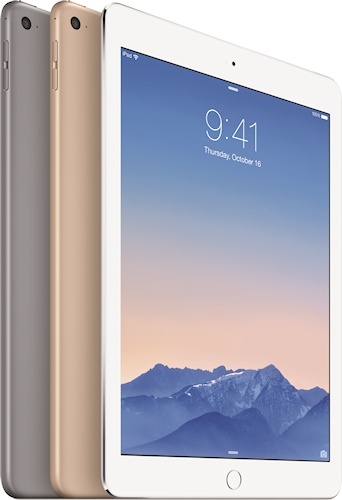 The iPad Mini 3 will ship at pretty much the same time and in similar markets to the iPad Air 2. As with the iPad Air 2, the comparison is much more stark when you look at the two-year-old original iPad Mini which is much less capable than either the iPad Mini 2 or Mini 3 (both of which will remain on sale together). Both these new iPads come with iOS 8.1, an update to the troubled iOS 8 operating system that was only announced a month ago with the iPhone 6. Overall these two new devices do not offer anything radically new, and we're not sure how many people will want to use Touch ID while out shopping, but the increased internal storage in both models does look appealing and the prospect of an even faster iPad Air should satisfy power users.